Nancy Pelosi called Trump’s tax cuts for workers “crumbs”. Thousand dollar crumbs, but still crumbs. 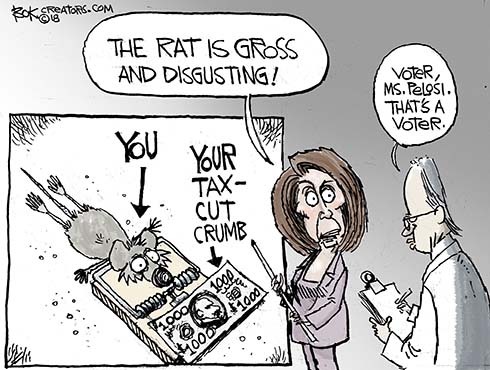 No doubt the House Minority Leader from San Francisco does have thousand dollar crumbs on her plate. By her lights those crumbs are a “little piece of cheese in a mouse trap” for the little people who elect her to do what she does. I don’t think she gets why her party has crumbled.